Phalaenopsis orchids, or moth orchids as they are often called are the most common type of orchid to be grown at home. It’s not hard to see why they are so popular, with their long lasting, beautiful blooms. However, it’s important to know how to fertilize phalaenopsis orchids to keep them healthy and ensure that they rebloom time and time again. How to fertilize phalaenopsis orchids. Fertilize your phalaenopsis orchid every 1 to 2 weeks during the growing season and every 3 to 4 weeks during the winter and while blooming. Use a formulation made specifically for orchids at no more than half the recommended strength. Fertilizing your phalaenopsis orchid properly can be a little tricky, so the rest of this article will go into detail to make sure that you get it just right, and are able to keep your orchids healthy and thriving. Phalaenopsis orchids do need some fertilizer to maintain optimal health, but they are light feeders and do not like or tolerate large amounts of nutrients on a regular basis. It is very easy to over-fertilize phalaenopsis orchids, which can lead to nutrient toxicity and damage to the foliage and roots. The growth of all orchids will be limited by one or more factors, whether this is light, heat, genetics or availability of nutrients. Once a phalaenopsis orchid has sufficient nutrients, adding further nutrients will not speed up the growth rate or make the plant healthier. Read here for more general phalaenopsis orchid care tips. To keep your phalaenopsis orchid healthy, all you have to do is to provide sufficient nutrients to ensure that the plant has enough to grow. This is actually really easy as phalaenopsis orchids do not need an awful lot of fertilizer. If in doubt, fertilize less often and with a weaker solution than your instinct tells you. By doing this, you are unlikely to damage the plant with excessive fertilizer. What Nutrients Do Phalaenopsis Orchids Need? Orchids need three main nutrients to promote healthy foliage and bloom growth. These are nitrogen (N), phosphorus (P) and potassium (K). Any fertilizer you buy should list the NPK ratio on the packaging. In addition to these three main nutrients, all plants including orchids require an additional 14 micronutrients to thrive. Most plant fertilizers do not include these additional 14 nutrients, as they are only needed in very small amounts and plants will normally get sufficient quantities of these from the soil or potting media they are planted in. As orchids are often planted in very fast draining and nutrient deficient potting media, they can sometimes develop deficiencies of one of these 14 micronutrients. If you live in a hard water area, it is likely that your tap water will contain sufficient quantities of at least some of these micronutrients. However, if you are using distilled water, rainwater, or if you live in an area with very soft water, you will need to ensure that you use a fertilizer that contains these 14 additional micronutrients. If in doubt, I would be inclined to choose a fertilizer that has been formulated for orchids and does contain these 14 additional micronutrients. Choose a fertilizer that is suitable for your phalaenopsis orchid and the growth medium that it is growing in. I’ll cover some specific recommendations for fertilizers later in this article. There are so many different fertilizers available and it can be difficult to know which is the best one to use. If you are a beginner or a casual grower, there are some perfectly good, inexpensive orchid fertilizers, but if you really want to get the most out of your orchids, or if you have a large collection, it is well worth getting one of the more specialist formulations. Read the instructions carefully to make the fertilizer up. Use a measuring spoon to ensure you add the correct amount of fertilizer. For the vast majority of formulations, I would recommend diluting the fertilizer to half the recommended strength or less. This is a good idea as orchids are sensitive to overfeeding, and fertilizing with a weaker solution more frequently is better than using a stronger solution less often. Use a watering can with a narrow spout, or suitable container that will be easy to pour precisely for your fertilizer solution. If your orchid is very dry prior to applying your fertilizer solution, consider running some water through the growth medium first. See here for how to water phalaenopsis orchids. Many experts advocate this for a number of reasons. Firstly, there is a small risk of burning the roots if you are using a fertilizer solution that is excessively strong. If you’re using a dilute solution of half or less of the recommended strength, this is unlikely to happen. Secondly, some experts believe that by wetting the media first, this increases the absorption of the nutrients by the growing media and improves absorption by the roots. I like to bring my orchids to the sink to fertilize them as this produces less mess and ensures they are well drained after watering and fertilizing. Hold your orchid over the sink or even set it in the sink before starting to slowly pour the fertilizer solution over the potting media. Take care to avoid getting any of it on the leaves or flowers of your orchid. Ensure that all areas of the potting media are thoroughly soaked in the solution. Ensure all the excess fertilizer solution drains out the bottom of the pot. You do not want your orchid sitting in a puddle when you return it to its normal location. I normally let my phalaenopsis orchids drain passively in the sink for 2 to 3 minutes before returning them to their decorative pots. I recommend fertilizing your orchid every two weeks during the vegetative stage in between blooming cycles and reduce this to once every 3 to 4 weeks during blooming as the nutrient needs will be much less during this time. Watch your plant closely and take into account the growth rate and condition of your plant, the ambient temperature and the time of year to adjust how much and how often to fertilize your plant. What Is The Best Fertilizer For Phalaenopsis Orchids? So you know the process for fertilizing your orchid, but you still need to choose which orchid fertilizer to use. Here are the best options to choose from. rePotme Orchid Fertilizer – Developed by Michigan State University and endorsed by numerous national orchid societies, including the American Orchid Society. This is some of the best orchid fertilizer you can get that has a proven track record. Jacks Classic Liquid Orchid Food – Jack’s Classic is my personal favorite. It is a terrific fertilizer and I prefer it to the rePotme formulation as it comes in a liquid. This makes it easier for me to make up smaller batches of fertilizer solution when I only have a few orchids to feed. Miracle-Gro Orchid Food – A much more affordable, but less complete formulation of orchid fertilizer. For most casual home growers, this will do a very good job. Generally, a balanced fertilizer will work well for phalaenopsis orchids, as long as it contains all the necessary trace elements in addition to the main NPK component of the fertilizer. Due to the non-retentive nature of most phalaenopsis orchid growth media, you need to ensure that the fertilizer is able to be absorbed immediately by the plant. For this reason, you should choose a fertilizer that contains at least half of the nitrogen in nitrate form and less than half of the nitrogen in the ammonium or urea form. Urea-based forms of nitrogen have a number of drawbacks for orchids over nitrate forms of nitrogen. Urea-based nitrogen is not immediately available for the plant to use and requires nitrifying bacteria to convert the nitrogen to the nitrate form. Many orchids are also grown in pine bark, which is a naturally acidic media. Nitrate fertilizers generally raise the ph around the roots, whereas ammonium and urea based forms of nitrogen cause further acidification of the rootzone. Thankfully, most commercially available orchid fertilizer contain the correct amounts and types of nitrogen for most domestic orchid growers. Should I Use A Bloom Booster Fertilizer For My Orchids? Some people recommend using a bloom booster fertilizer during the blooming phase of your orchid’s life cycle. The theory here is that the additional phosphorus, which is essential for healthy bud and bloom development, will lead to additional and more healthy blooms developing. Whilst there are a number of very good orchid fertilizers that do have different formulations for blooming and vegetative stages, I do not believ that this makes much difference in reality. Remember that phalaenopsis orchids are light feeders, so it is not hard to provide sufficient quantities of the required nutrients. Beyond this level, there is likely to be another limiting factor in the number and quality of blooms that your phalaenopsis orchid produces. This advice is backed up by research which was done by Y.T. Wang, published in Scientia Horticulturae in 1996 and 2000. 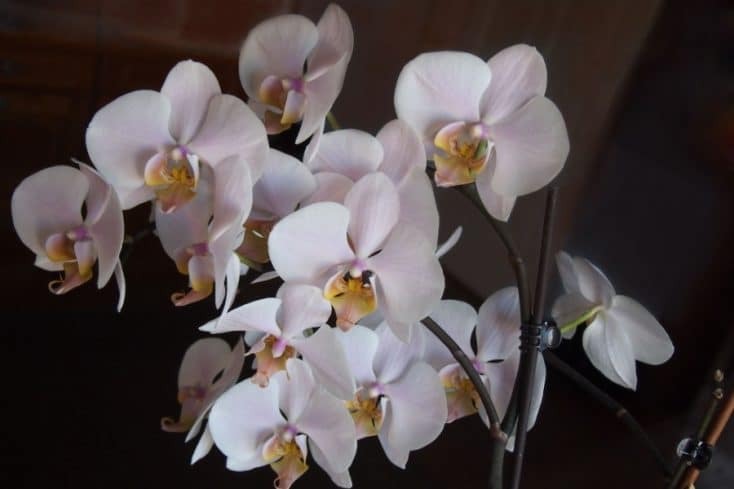 This research didn’t find any statistically significant difference in the growth and health of phalaenopsis orchids when testing 6 different concentrations of water-soluble fertilizer solution. He tested 10:30:20, 15:20:30, 15:20:25, 20:5:19, 20:10:20, and 20:20:20 formulation. This would suggest that all of these strengths of fertiliser provided sufficient nutrients for the phalaenopsis orchids to grow healthily and that there was an alternative limiting factor on their growth rate. I really think that the most important thing with phalaenopsis orchids is to make sure that you do not over fertilize them by applying the fertilizer too frequently or using a solution that is too strong. By remembering this one main point, I believe you will avoid most of the problems that people encounter with fertilizing phalaenopsis orchids. Should I Fertilize My Phalaenopsis Orchid Every Time I Water It? It is entirely possible to fertilize your phalaenopsis orchid every time you water it, as long as you’re careful. In fact, many experienced growers recommend fertilizing your phalaenopsis orchid in exactly this way, And the term “weakly weekly” has become a common saying amongst orchid growers when describing how you should fertilize your plants. As phalaenopsis orchids are epiphytic plants, they are ideally grown in potting media that does not retain a lot of water. When you water or fertilize phalaenopsis orchids, much of it will run through the pot and little will be retained within the potting media. Therefore, much of the benefit of fertilizing your orchid is gained by the direct absorption of nutrients immediately after they are applied to the plant. Having said this, orchids do not need a lot of nutrients, and the main goal is to prevent nutrient deficiency. If you fertilizer orchids too often, or use a nutrient solution that is too strong, there will be a build up of nutrient salts within the potting media and around the roots, which can lead to toxicity and root damage. I think it is generally a better solution to alternate fertilizing and watering your orchid. In practice, this means that I will water my phalaenopsis orchids with a half-strength fertilizer solution, but the next time I feel the plant needs to be watered, I will just use liberal amounts of water to hydrate the plant and also to flush the potting media of any excess nutrient salts. Do You Fertilize Orchids In Winter? Phalaenopsis orchids can grow all year round, so you should continue to fertilize your phalaenopsis orchid throughout the winter. However, they will need variable amounts of fertilizer at different stages of their growth and at different times of the year. In the winter, the conditions are normally colder, and there will be less light to promote rapid growth of the foliage and roots. For this reason, the orchid will require less nutrients and you should reduce the frequency of fertilizing to every 3 to 4 weeks. Do You Fertilize Orchids When In Bloom? You should continue to fertilize your phalaenopsis orchid even while they are in bloom. However, the nutrient requirements of a phalaenopsis orchid while in bloom will be less than when it is actively growing during the vegetative stage. For this reason, reduce the frequency of fertilizing your phalaenopsis orchid to once every 3 to 4 weeks while it is in bloom. Can I Use Regular Plant Food On Orchids? You can certainly use regular plant food on orchids, provided it contains all of the nutrients that your phalaenopsis orchid requires. Just make sure to take note of the concentration of the main nutrients in the fertilizer that you are using, and dilute it to a suitable strength for orchids. You will also need to make sure that your orchid is receiving sufficient quantities of micronutrients, either through the potting media or through the water you use, to prevent deficiency. If you begin to experience symptoms which may be due to nutrient deficiency, switch to a more complete orchid fertilizer. When Should I Fertilize My Orchid After Repotting? Repotting is traumatic for a phalaenopsis orchid, and they will need a little bit of additional care after you repot them. See my guide to repotting orchids. Regardless of how carefully you repot your orchid, the roots can suffer a little damage and will be less closely applied to the new potting media. Water and nutrients will be more difficult for the orchid to absorb for a few weeks after potting. After repotting your phalaenopsis orchid, you should water and fertilize the plant at least every week, and monitor the dryness of the roots and potting media very carefully for at least a month. After about a month, the new potting media should start absorbing more water and the roots should recover and begin to function more effectively. At this point, you can reduce the watering and fertilizing schedule back to normal. 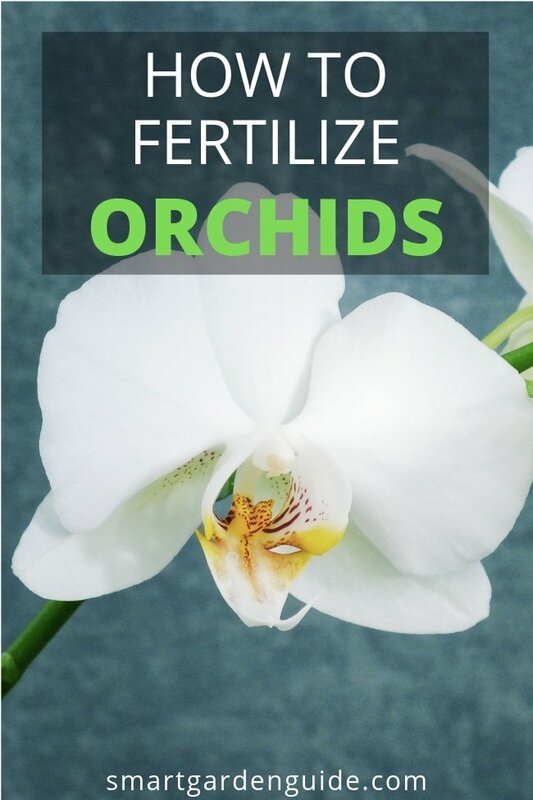 How Do You Fertilize Orchids Naturally? It’s actually entirely possible and quite easy to make your own natural fertilizer for orchids. Combinations of eggshells, molasses, coffee grounds, seaweed and milk can all be used to make fertilizer for your orchids. Sure, it’s much less precise, but plenty of people have had great success using natural, home-made fertilizer. Try these recipes for natural orchid fertilizer. Nitrogen deficiency can cause major problems for your phalaenopsis orchid. It can cause leaf chlorosis, leaf drop, reduced leaf growth, and stunted stem and flower spike growth. Nitrogen is most important for healthy vegetative growth. Phalaenopsis orchids are most likely to suffer from nitrogen deficiency during the vegetative stage when they are growing most rapidly. See my article on how to make phalaenopsis orchids rebloom. Phosphorus is essential for orchid metabolism and respiration and allows the plant to convert carbohydrates into a form that can be used for growth. As a result, an orchid that has insufficient phosphorus will have its growth stunted there can also be red discoloration of the leaves due to reduced respiration, favoring the production of anthocyanins. It’s often very difficult to detect a specific phosphorus deficiency in phalaenopsis orchids, as it will often just present with stunted growth until it is quite advanced. Orchids affected by potassium deficiency can often have irregular yellow areas on their leaves. Potassium deficiency can also cause curling of the leaves and a burnt appearance to the leaves. I have an article here about why orchids get yellow leaves. I hope this article has been useful to you. 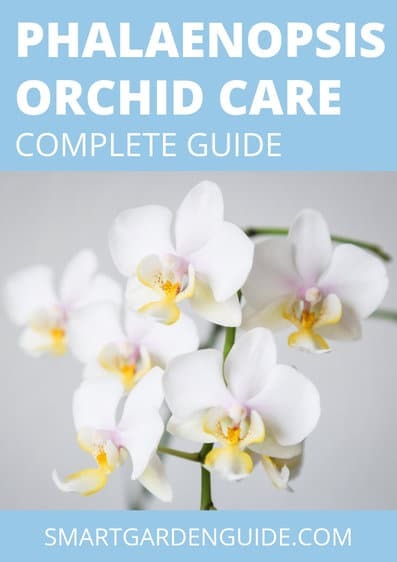 If you would like to learn more about caring for orchids, and in particular, phalaenopsis orchids, check out my orchid section.